So, what makes the best pillow? This is a common question that doesn’t have a straight forward answer because there are so many different types of pillows with different filings, firmness and lofts. Your sleeping style will determine the pillow that will be best for you, but we’ve created this guide to answer your questions and show you the benefits and drawbacks of each type of pillow allowing you to make an easy buying decision. 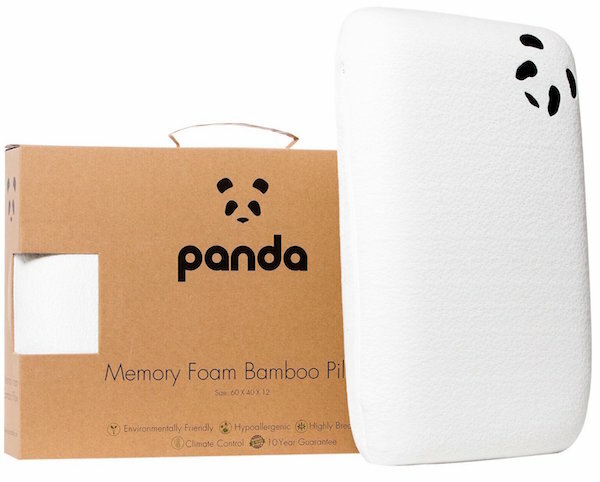 The Original Panda pillow is manufactured using bamboo memory foam and has a triple layer of moulded memory foam to increase the level of comfort and support. The pillow has great temperature regulating technology which works to keep you warm in the winter and cool throughout summer as it allows air to flow through the material freely. Bamboo is naturally resistant to mould and antibacterial which protects your skin against irritation. The bamboo fabric is anti-static, so it so doesn’t cling to your skin while you sleep. The pillow is suited to side, back and front sleepers and keeps your neck and spine supported aligned throughout. The pillow is recommended by doctors and orthopaedic experts alike and includes a 10-year manufacturer guarantee in addition to a 100% money back guarantee if you’re not entirely happy with the results you experience by using this pillow. Simba has a simple mission statement to make sleeping simple by using the latest advancements in technology and data to create market-leading products that adapt to each user’s individual sleep needs. They have created this state of the art pillow made from soft memory foam that works to adapt and contour to the shape of your neck and head offering unbeatable support. The pillow is fantastic for all sleeping positions including side, front and back sleepers and works to keep your spine aligned while you sleep. The high-quality memory foam returns to its original shape once you have finished using it. Also included is a 100% hypoallergenic removable machine washable cover so even the users who are extremely sensitive to allergies can use this without issues. 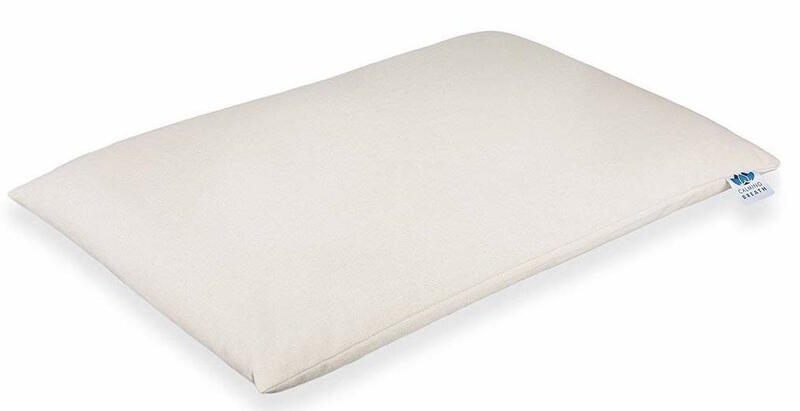 This UK made pillow has a feather core to provide support to your neck and head, with a cosy and soft down filing which is extremely comfortable to sleep on for long periods, so you wake up feeling relaxed. The pillow is covered in a removable pure cotton down-proof cover which prevents filings from escaping from the pillow. The pillow is medium-firm and works to keep your spine aligned and neck supported. The fabric of the cover is tightly weaved to create a barrier against dust mites reducing the effects of allergies. It also comes with a two-year warranty, and with John Lewis, you can be assured that you’re buying a high-quality product. Tempur was one of the first manufacturers to use memory foam as a retail product and have been in the market for many years. This firm pillow is suited to those who crave that extra firmness that isn’t gained from a medium-firm memory foam pillow. Tempur uses premium materials, so this product will last for many years before it eventually loses shape as with all pillows. The main benefit of memory foam is that it allows your neck and head to sink into the foam while keeping you supported, then when the pressure is released, it returns to its original shape. The pillow comes with a 100% soft cotton cover. In addition, there is a 3-year warranty provided for added peace of mind. This Soak & sleep pillow provides you with a choice of firmness to suit your sleeping style and position. It's manufactured using 90% Hungarian Goose Down for a comfortable outer layer with a Goose Feather core to provide support to your neck and head. The soft/medium pillow has a lower profile which makes it ideal for front, and side sleepers whereas the medium/firm option provide more support making it ideal for back and side sleepers. The Hungarian Down is washed in natural spring water and is free of harsh chemicals leading to it being approved by Oeko-Tex, EDFA and No-mite, while being covered in a soft 280 thread count casing for added soft plush comfort. You know that you’re getting a premium product made from premium materials. 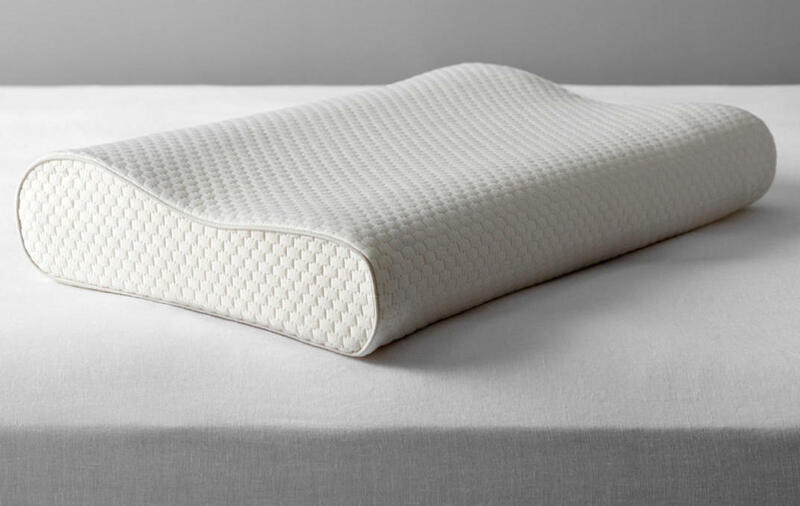 John Lewis has manufactured a specialist memory foam pillow that is suitable for both back and side sleepers. The shape of the pillow is shaped differently at both ends, with the larger contoured end supporting spine alignment for side sleepers. The opposite end has a shallower end which is suited to back sleepers. This pillow is great if you like using memory foam but find the Tempur pillow to be too firm. This provides an ideal combination of sink and support, so you don’t feel like you’re overheating throughout the night. Also included is a five-year warranty so if any defects develop with the product, then you can return to the John Lewis for a free replacement. Dunlopillo has created this signature latex pillow made from Talalay latex, which when used relieves pressure and tension from your neck and head area with a medium/firm rating. Latex is traditionally dense; however, this doesn’t cause you to overheat because air can flow in and out of the pillow with ease, so you stay cool through the summer months. The latex used is 100% natural, so you can be assured that this is the best quality latex pillow available on the market. The pillow is also mite free and hypoallergenic, so it's even suitable for those who suffer from allergies. The pillow aids blood flow so your cells can repair at a faster rate throughout your sleep, while the pillow comes in a removable machine washable cover. 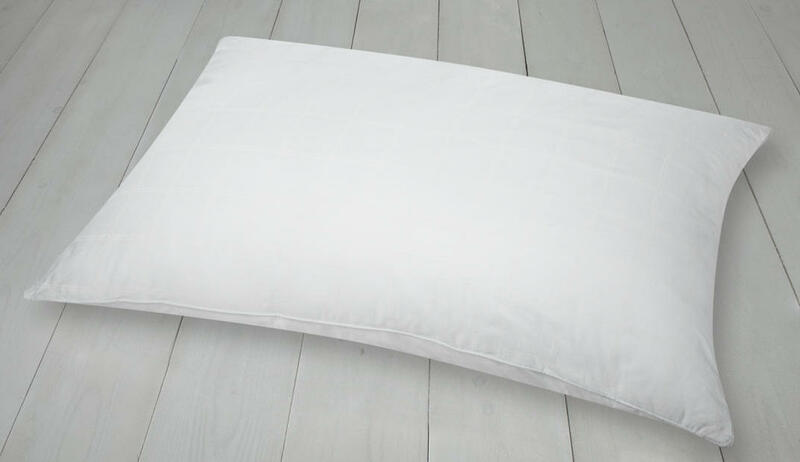 Front sleepers require a pillow that's slightly thinner and is softer in firmness, and this John Lewis Natural White Goose Down Standard Pillow fits these needs. The soft firmness allows you to sink into the pillow while retaining the supportive feeling. This pillow is made so the Down is breathable which allows air to flow in and out of the pillow to wick away moisture throughout the night, improving the quality of your sleep. The pillow has a removable soft cover which is machine washable while also being Nomite rated making it suitable for users with dust mite allergies. The pillow comes with a five year manufacturers warranty which protects you against any potential defects that may occur with the product. Buckwheat is a newer type of pillow filling that is fast gaining popularity within the pillow market. The buckwheat is triple-cleaned and contains hulls that work individually to contour and mould to the shape of your neck, head and shoulders while you sleep keeping you comfortable. 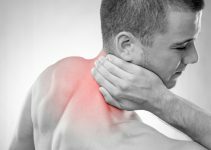 Buckwheat filling also works to relieve existing pain that you may be suffering from with many users reporting this, especially for neck pain. The pillow is also temperature regulating providing warmth throughout the winter and cooling in the summer month as air can circulate through the pillow with ease. Because the Buckwheat can move around freely inside the pillow, you can mould it into any position you like which makes it suitable for a range of sleeping positions whether you’re a front, back or side sleeper. 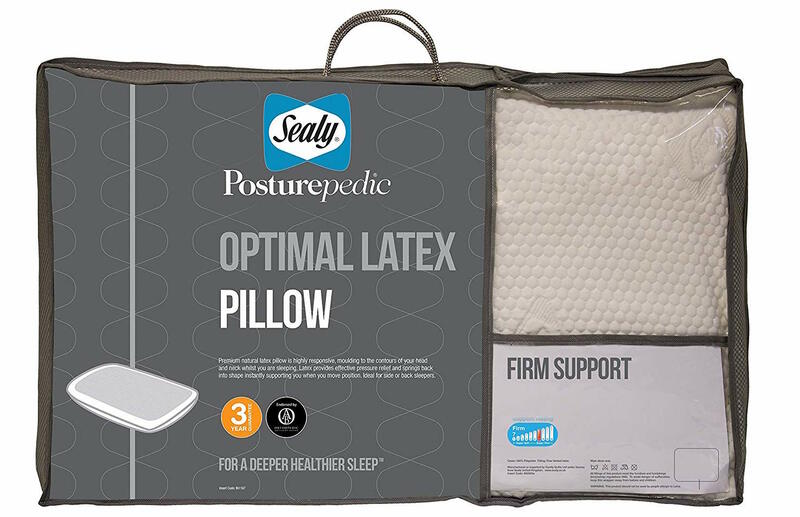 Sealy has manufactured this pillow using natural latex which not only provides support but also bounces back when you change position while you sleep. This has been designed for back and side sleepers. The latex is also vented so air can flow in and out of the material to keep you cool as you sleep. This pillow has gone through many revisions to ensure that it has the optimal firmness, design and height. The latex is firm which makes sure your spine remains aligned and supported while also being cosy to sleep on, so it doesn’t feel like you’re sleeping on solid rock. 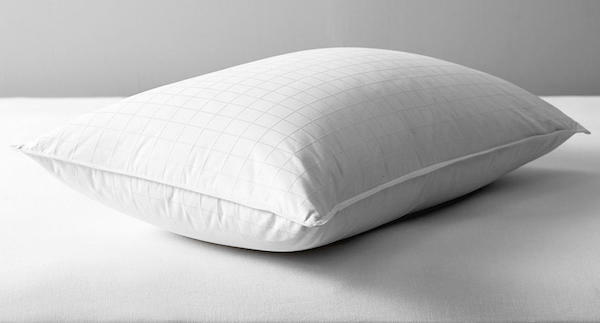 Buying a higher quality pillow like this ends up being more affordable than having to buy and replace cheaper pillows constantly. The pillow is supplied with a removable cover which can be machine washed so you can keep the surface that your face touches fresh and clean. The material of the pillow is an essential factor because it determines the feeling, comfort, durability and cooling ability of the pillow. There's never going to be a single pillow type that is the best because different sleeping styles are better suited to different kinds of pillow materials. We’ll take you through the different types including the positives and negatives. Even though there are three main types of memory foam, there are three forms that the foam can come in, with each bringing different benefits. This usually comes in the solid block of foam which allows you to sink into it as it contours around your body making it outstanding for comfort. The most popular foam pillows come in this form and are also ideal for providing relief to those that already with existing pain. Shredded foam pillows are made using thousands of small sized foam shreds which are then packed closely together inside the pillow. This allows the pillow to be more breathable and also adjustable in height and shape. Noodle foam is manufactured into long noodle shapes which can vary in length and width. It's similar to shredded foam with strong breathability to keep you cool, and also the filling binds together more easily so it retains its original shape more than shredded foam. Memory foam is one of the most popular pillow fillings especially amongst those who struggle with pain along their neck, shoulders and back. Memory foam contours to the shape of your head and shoulders providing support while also having a degree of sink ,so it’s also extremely comfortable. Memory foam relieves pressure and tension from your joints and muscles as you can fully relax them throughout your sleep. The added benefit of memory foam is that once you’ve finished using it, it returns to its original shape. Traditionally memory foam used to sleep very hot; however, newer memory foam models incorporate new cooling layers that allow air to flow easily through the materials. Memory foams come in a range of forms including the traditional block to shredded and noodle. Latex pillow filling is extracted from rubber trees in the form of sap, which is then further treated to create the final version. There are two types of Latex pillow, natural and synthetic. Latex pillows keep overheating to a minimum as they allow air to flow in and out of the pillow, so this is a cooler version of memory foam. Latex retains its shape over a long period and contours to the shape of your body each time that you use it providing added support to your shoulders, head and neck. Latex pillows also work to maintain natural alignment and are hypoallergenic so is excellent if you suffer from allergies. Polyurethane Foam is the most affordable option of the three and provides a more balanced feel which has less support and comfort. It does mean that it’s cooler than memory foam. Because it has the least natural manufacturing process, it does have a stronger initial odour when you purchase it. We would recommend that you spend a little bit more to get a traditional memory foam or latex version if you want to experience all of the benefits. The first thing to understand is that natural and organic are two separate things. A natural pillow means that it has been manufactured using materials that are natural which could be cotton, wool, natural latex etc. It means that the materials are found in the natural environment but doesn’t mean that these materials are treated naturally during manufacturing. An organic pillow uses natural materials but uses processes that are also organic which means that it's free of harmful chemicals and pesticides. This also means that the product has to go through third-party auditing by an official board for the product to be certified as organic. The main natural & organic pillow fillings include Down Feather, Buckwheat, Cotton & Polyester. Down feathers are usually sourced from Geese, ducks and occasionally swans, and are soft in feel creating a soft plush pillow. Feathers of different densities are often blended together to create different levels of firmness. These types of pillows generally have a greater loft which keeps your head and neck in a higher position. Heat is not retained in Down & feather pillows and they can alter the shape so it suits your sleeping position. 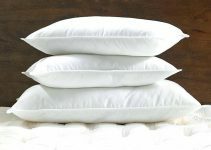 Over time the cheaper Down Feather pillows begin to flatten out, however they're often more affordable than other types of pillows. It’s important to note that the majority of Down pillows need to be dry cleaned and can’t be machine washed. If you’re looking for a natural or organic pillow, then a buckwheat pillow could be very suitable for you. Buckwheat hulls are used to fill the pillow which makes them very dense and firm, so you’ll feel well supported as you sleep. Because each hull works individually from the other, Buckwheat pillows are adjustable so you can mould them into your desired shape which makes them suitable for all sleeping positions. This also makes them very breathable as there is space between the hulls for air to circulate. If you suffer from allergies, then this pillow is suitable for you as it's hypoallergenic. 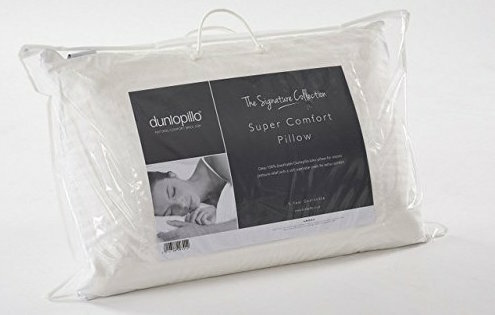 You can tell the difference between this and unnatural pillows because this has a strong fresh smell which will also aid you to get to sleep easier and the smell will relax you. Cotton is 100% natural and is often used to fill pillows and is one of the more affordable options. As a result of being natural, it means that it's hypoallergenic so is ideal for those that suffer from allergies. Cotton pillows have a high loft and have strong airflow to keep you cool, wicking away heat from your skin. Cotton pillows may be more affordable, but they lose shape and flatten more rapidly. The filling may also clump depending on the position you sleep in. 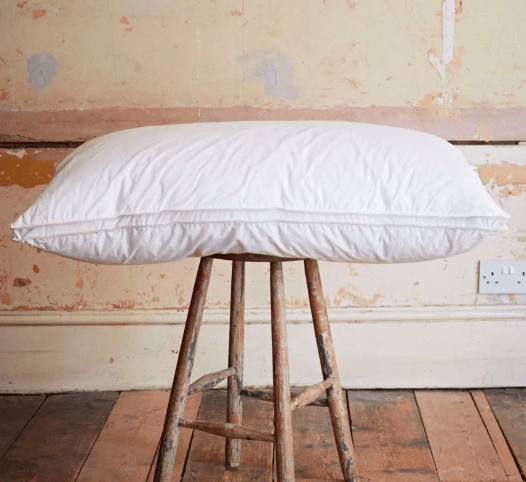 Cotton pillows come in a range of different densities, lofts and shapes so regardless of your sleeping position you can find a cotton pillow to suit you. You’ll struggle to find someone who hasn’t used a polyester pillow at some point throughout their life. Polyester pillows are similar in feel to cotton pillows while providing effective cooling and loft properties ensuring that you not only stay cool but that your head stays strong supportive position. Polyester pillows are prone to flattening easily which shortens their lifespan, so they'll need to be replaced more frequently. Caring for Polyester pillows is easier as they can be machine washed and tumble dried. They are one of the more affordable types of pillows available on the market. We wouldn’t recommend getting a polyester pillow. However, you can get pillows that have a blend of fillings including polyester to allow you to experience all the benefits of it, without the obvious negatives. Finding the best pillow can be difficult because everybody has different sleeping styles. The position that you sleep in will have a significant impact on the pillow you choose depending on whether you sleep on your front, side or back. Some people may not fit into just one sleeping position as you may switch during the night. The main aim for a back sleeper is to keep the neck and spine healthily aligned without raising your head too much as this can cause straining. Loft refers to the height of the pillow, and a medium loft is ideal for most back sleepers. The loft that’s suitable for you will be determined by individual factors such as your weight, size of shoulders and head. For example, a heavier person may need a slightly higher loft because their weight will sink them further into the pillow. If you sleep on your front then you need the least amount of loft because the main aim is to keep your head aligned with the rest of your body, so the lower the loft, the better. Again, the pillow you choose will be affected the weight of the user, head and shoulder size so that a heavier person may be better suited to a medium lofted pillow. The ideal pillow for stomach sleepers also has a degree of sink and is soft leading to a comfortable sleep while maintaining correct spine alignment. Side sleepers are often the hardest to find a suitable pillow for because of their loft requirements which is why they’ll usually end up folding or scrunching up their pillow to find their ideal loft. An adjustable loft is ideal because it means you can set your height preference, so your neck and spine remain aligned. Memory foam and latex provide the firmness that you need as well as the loft whereas Down feather pillows provide the adjustable loft to suit your custom needs. Snoring isn’t only bad for you but can also be a massive problem if you’re sharing the same bed with another person. In more severe cases you may need a mouthpiece or head guard, but in most scenarios, you might need to get a more suitable pillow. Side sleepers don’t usually suffer from snoring and is more common amongst back sleepers. A good memory foam pillow will work to elevate your head which will open up your airways so it’s less likely to be obstructed so your snoring will decrease. Babies may be allergic to certain types of substances but haven’t been diagnosed yet, so you’ll need to be extra safe by purchasing a pillow with hypoallergenic material or cover. A soft pillow for a toddler may seem like the best choice, but it can be an issue because it may not provide enough support so their face sinks into the pillow which can cause suffocation. Ideally, you should purchase a medium firm rated toddler pillow. The leading toddler pillows use memory foam because this provides excellent support and comfort to the developing toddler's body and provides more restful sleep. During pregnancy, women often use specially designed pregnancy pillows which are enlarged pillows which increase the level of comfort. This is because, with the added weight of the baby, a common complaint is that it becomes uncomfortable for the mother to sleep. Because pregnancy pillows are large, you need to ensure that your chosen pillow will fit in your existing bed and that it fits your body size. If you need more support and a hugging effect, then memory foam will be suitable. However the most common is polyester as the shape can easily be adjusted to your needs and makes little noise throughout the night. It’s important that the pillow filling or the cover is hypoallergenic not just for the mothers' benefit but also the child as they will also suffer from the reaction that the mother has. Back sleepers need a pillow that has a medium loft that provides support and contouring to the spine. Side Sleepers require more support because less of their body is in contact with the surface. Front Sleepers need a lower lofted pillow, so the head remains aligned with the rest of the body. If you suffer from allergic reactions, then you don’t need to worry about having a limited choice because the pillow industry has undergone such a transformation, that it’s almost normal for pillows to have hypoallergenic properties which are even more common amongst latex, buckwheat and memory foam. It’s crucial to check, but either the material, the cover or both will be rated as hypoallergenic. Water pillow – Structured like traditional pillows but has an in-built layer of water. Down pillows – Down naturally promoted airflow in and out of the material keeps you cool. Buying a cooling pillow doesn’t differ from purchasing any other type of pillow; you still need to consider the overall firmness and size to ensure that it suits your sleeping style.